On Friday Dec. 9, 2011, approx. 60-70 protesters gathered at 200 Burrard St. in downtown Vancouver to protest the proposed Pacific Trails Pipeline. The rally was organized by Vancouver anarchists in solidarity with grassroots Wet’suwet’en, who are opposing 7 pipelines in total. Protesters skirmished with police and released a banner attached to balloons inside the lob by of the building where Apache Corp. has its Vancouver office. Activists converge on the offices of Apache Corp. to protest a natural gas pipeline linked to fracking operations in BC and Alberta. A group of 30 to 40 people gathered today for a demonstration at the entrance of the downtown Waterfront Centre, protesting the construction of the Pacific Trails natural gas pipeline in northern British Columbia. The pipeline in question is intended to stretch over 450 kilometres across the province from Summit Lake to a port in Kitimat, carrying natural gas from shale deposits in northeastern BC and Alberta. This type of natural gas is extracted from underground rock through hydraulic fracturing (or “fracking”), which involves injecting water and chemicals at high pressures to allow the gas to escape. “Fracking has become more well known in the last few years because of the dangers to the environment that it poses,” said Gordon, one of the speakers at today’s demonstration. Gordon made note of recent demonstrations at an affiliated Apache natural gas plant in Argentina, where indigenous Mapuche protesters caused disruptions citing serious concerns over water contamination. He also mentioned ongoing concerns around health and safety in communities like Dawson Creek, BC, where residents have reported health problems due to fracking and other natural gas operations. If completed, the Pacific Trails project would allow gas from the interior to be transported to a liquid natural gas (LNG) facility in Kitimat, where it could be liquefied and shipped to Asian markets using tankers. Canada currently only operates one other LNG port, located in St. John, New Brunswick. Another hot topic at today’s demonstration was the proposed Northern Gateway pipeline from the tar sands to the northern BC coast. While Enbridge has faced intense opposition from First Nations over their oil sands project, a number of Aboriginal leaders from communities along the Pacific Trails route have already signed on to endorse the gas pipeline. “Almost all the band councils along the proposed route have come out in opposition against the Enbridge pipeline and the Kinder Morgan pipeline,” said Gordon, noting recent disagreements over a deal made by Gitxsan negotiators he referred to as “sell-outs”. 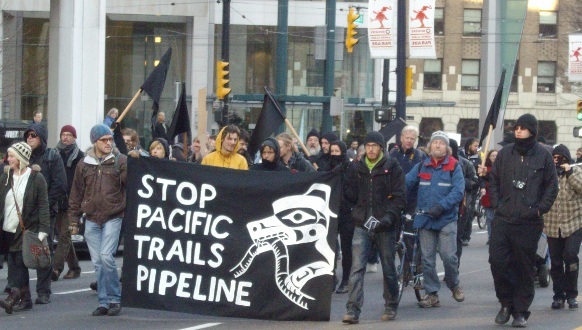 “The Pacific Trails pipeline is different. Because it’s natural gas, it faces less regulatory hurdles and it’s being expedited,” Gordon said. The $1 billion Pacific Trails project has already been approved by the National Energy Board, with operations expected to begin in 2015. But there are a few key holdouts who remain strong in their refusal to allow oil and gas development on traditional territory. Members of the Wet’suwet’en Nation, a major party in opposition to the Pacific Trails pipeline, recently created a roadblock to prevent machinery and pipeline workers from accessing their land. “We’re all in solidarity with people not just fighting Apache but people fighting resource extraction on indigenous land,” said an organizer at today’s protest, going by the name of Frank. “This is going to continue. This is just the first action, and with every action we’re going to escalate,” he said. At one point during the demonstration, things seemed to be escalating already, as protesters attempting to enter the building were pushed and forcefully held back by police blocking the doorway. The lobby of the Waterfront Centre appeared to be on lockdown, with security gates drawn to keep protesters out. After leaving the Waterfront Centre, the protest marched along W. Georgia Street and one man was reported to be arrested for breach of peace. Representatives from the Apache Corporation have yet to respond to the Vancouver Observer’s requests for comment. VANCOUVER — A man was arrested for breaching the peace after an anti-fracking march this afternoon in downtown Vancouver. 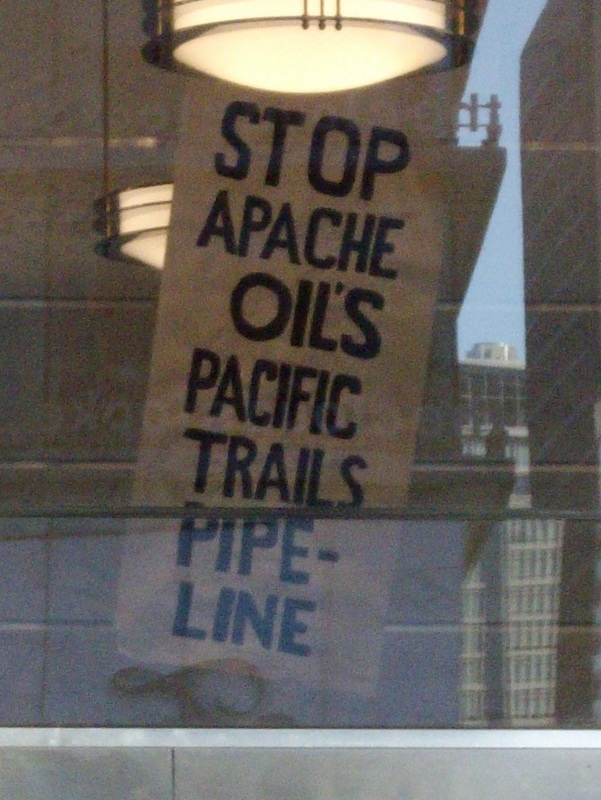 Close to 100 protesters tried to occupy the lobby of 200 Burrard Street – which is a floor above the Waterfront Centre food court – in protest against Apache Pipeline Products and that company’s construction of the Pacific Trails Pipeline. “The doors had been locked by the property owner and the man was arrested for trying to break into the building,” said police spokeswoman Const. Jana McGuinness. The man was released from jail around 3 p.m. McGuinness said. The pipeline would carry liquid natural gas 463 km from Summit Lake in central British Columbia to Kitimat on the coast, where a facility is slated to begin exporting the gas to East Asia come 2015. Apache owns a 40 per cent stake in the terminal, which will export shale gas from northeastern B.C. Protesters are against the extraction process of the natural gas there known as hydraulic fracturing or fracking, which taxes local water resources. After police blocked them from the lobby, the protesters marched up Burrard Street to occupy the Grosvenor Building lobby for several minutes before dispersing towards the art gallery. Police said they were concerned when they saw about a dozen of the protesters clad in black waving black flags. One man has been arrested for breach of the peace by Vancouver Police following a march this afternoon in downtown Vancouver. Approximately 80 to 100 protestors set off from the 200 block of Burrard Street at noon and attempted to occupy the lobby of a building on the northeast corner of W. Cordova and Burrard. Officers monitoring the protest restricted their access and the marchers set off on a new route that took them to the 1000 block of W. Georgia. A group of protestors then occupied the lobby of 1040 W. Georgia for a short period of time before heading back towards the Vancouver Art Gallery. Nearly a dozen protestors were masked, dressed all in black, and were carrying black flags. Protestors dressed in this manner have been linked to violent and criminal acts in the past. Five hours west of Prince George BC, members of the Unist’hot’en clan of the Wet’suwet’en nation have set up a direct action camp to defend their land, water and way of life from pipeline developments. massive projects, such as opening a corridor between the Alberta tar sands and the pacific ocean. Other companies already proposing pipelines include: Pembina, Kinder Morgan and Enbridge. All these pipelines aim to increase the oil and gas production for export to asian and american markets resulting in a large spike in oil tanker traffic that would threaten the entire coastal region. The Unist’hot’en have declared that none of these pipelines will cross their territory. them around. With actions and events starting Dec 9th in Vancouver, Prince George and elsewhere we will be continuing to escalate solidarity with this resistance. 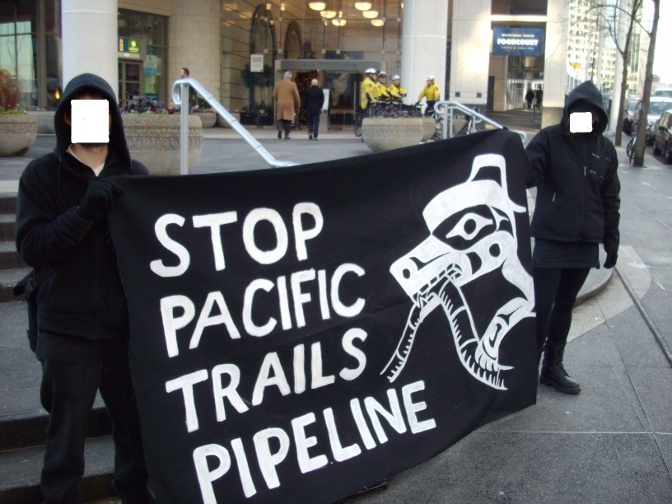 The three major shareholders of the Pacific Trails Pipeline are Apache Canada Ltd. (40 per cent and operator), EOG Canada; formerly known as Enron (30 per cent) and Encana (30 per cent). These companies all have many offices and projects all over the world. While this call out is focused specifically against the PTP, solidarity on Dec 9th means confronting destructive resource extraction projects in your own community as well. Solidarity means recognizing the threads between our struggles and understanding a collective self interest. Towards free communities and total liberation from capitalism and the state. Posted on December 10, 2011, in Defending Territory, Oil & Gas, Uncategorized and tagged anti-colonial resistance, Indigenous resistance, native resistance, oil and gas pipelines+Indigenous resistance. Bookmark the permalink. 1 Comment.